Preschoolers often spend a significant amount of time in family home childcare settings, and because of this, it is important that providers create an environment to help children develop healthy habits. Public Health of Seattle & King County in Washington (PHSKC) applied for and received funding from USDA’s SNAP-Ed program in 2015. The goal of the program was to encourage family home childcare providers to create a setting for children to eat healthier and be active to assure healthy development. 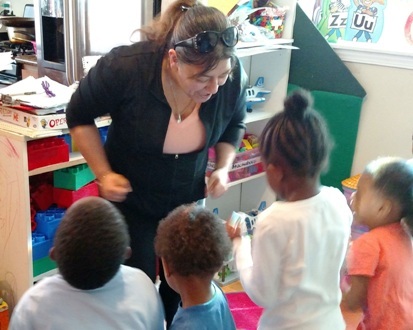 Nine family home childcare providers, serving low-income families in King County, were recruited and enrolled in the year-long program. All providers were successful in implementing at least one best practice, policy or environmental change to improve healthy eating, physical activity or limit screen time for the children enrolled in their childcare. The program’s Registered Dietitian (RD) met with each provider at their childcare site and together they completed the Let’s Move! Childcare Checklist. From this activity, the provider chose 2-3 goals that they were willing to work on. The RD was available during the year for technical assistance. A nutrition educator visited each site nine times and delivered Sesame Street’s Healthy Habits for Life curriculum to the children. During the lessons, children enjoyed activities such as trying new foods and playing games that provided physical activity. The nutrition educator modeled activities that providers could use to encourage healthy behaviors. Visits also offered an opportunity to check-in with the provider to offer technical assistance and support on achieving goals. After each lesson, a copy of the lesson and materials were given to the provider along with take-home activities and tip sheets to share with their families. The childcare providers earned professional development credits for attending two trainings based on the NAP SACC curriculum. They learned about topics related to obesity prevention for children in their care, how to engage with parents and how to improve their own health. Providers appreciated interactive training and engagement with other providers. PHSKC received funding again from the USDA’s SNAP-Ed program for 2016 and is currently working with 11 new sites. Currently within the Central Florida Collaborative of the National ECELC Project, there are 20 Orange County Head Start (OCHS) centers. OCHS Administration decided that each center will establish a vegetable garden to encourage fresh vegetable planting and healthy eating. Learn more about how states can use funding for obesity prevention efforts. Create a strategy to implement change by using the Spectrum of Opportunities. The Spectrum illustrates ways states and communities can support ECE facilities to achieve best practices for obesity prevention.